3. 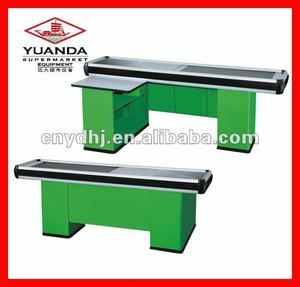 Material:stainless steel table surface,mian body is high-quality steel. 4. Any other sizes and colors are available. Please feel free to contact us for more details. Top board: Polished stainless steel and strong aluminum alloy border. We can provide accessories such as shopping bag holder, keyboard holder. Besides, the length of the belt can be made according to customers&rsquo; demands. Top board: Polished stainless steel and strong aluminum alloy border. Different thickness,size and colors are available for you to choose. For more choices and information, please feel free to contact us! 2 YRS Suzhou Aoside Shop Fittings Manufacture Co., Ltd. Choosing wire mesh back board ,LOGO lamp box and upper layers, different material combination give more option to the clients. Factory covers an area of 19,000 square meters and there are more than 100 employees. Back panel and layer boards packed with carton; the upright and brackets with air bubble foam. 2. Ten well-educated international sales team offer in-time service with 24 hours. 5. Let more international chain stores use Chinese retail equipments. We can : Tenet : to turn your ideas into products/drawings/samples. Top board: Polished stainless steel and strong aluminum alloy border. Border :Aluminum alloy border or aluminum plastic border for choice. We can provide accessories such as shopping bag holder, keyboard holder. 3 YRS Suzhou Hantop Logistics Equipment Co., Ltd.
12 YRS Suzhou Youbang Commercial Equipment Co., Ltd.
5. shining color create different mood in paying time. All of our products are well made and sell in competitive price . If you have any question,please feel free to contact me. You need to pay the freight first, after you confirm the order, we will deduct inside from the payment. If necessary, we can provide you with scanned copies of our . We welcome you to inspect our company at any time. 4 YRS Changshu Tianguan Metal Products Co., Ltd. Besides, the length of the belt can be made according to customers&rsquo; demands. 2. Motor: rotate speed is 0.15m/s; power is 120 watt; with CE certificate; 3. Voltage of motor: two kinds. 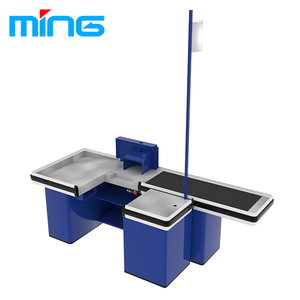 Automatic Checkout Counter with Shopping Bag Hook Our Advantage: 1.A professional manufacturer for iron product over 6 years 2.Professional designer could meet and improve your idea 3.Corrosion resistant and Durable materail with excellent surface treatment 4.Different surface treatment: chrome plating,spray coating and electrolysis. 10 YRS Changshu East De Run Metal Products Co., Ltd.
6.Top board: Polished stainless steel and strong aluminum alloy border. 8.Customized: available 9.Special design of the computer protection cover can make for you. 10. 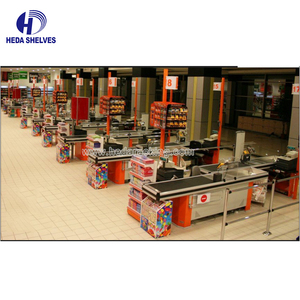 With or without Belt:Available Specification for checkout counter with belt a.
Carton box: 45*41*61CM, with 2 cash registers. Payment: T/T, Western Union Lead time: 15 to 25 days. Price term: FOB Guangzhou, CFR or CIF destination port. 1. Material: High density strong toughness E1 class environmental MDF 2. Surface finish: MFC Environmental material and HPL asurface finish 3. Glass: International standard safe and heatproof tempered glass 4. Hardware fitting: High quality electroplating stainless steel and aluminum hardware 5. 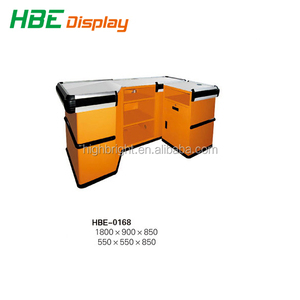 Professional design team, Sufficient production capacity, Skilled 6. 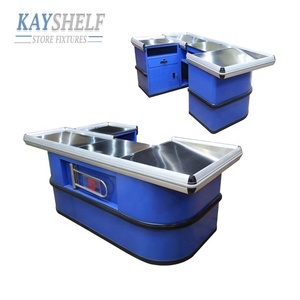 Craftsmanship, Strict quality control Name Cash Counter Design Model YD-R0001 Material Stainless Steel MOQ 5pcs Color Red, blue, black and so on OEM Accepted YES Delivery Time 7-15days Shipping Sea ship, air ship,express Packing Detail Standard Export Carton Packaging, we also can pack as you require. 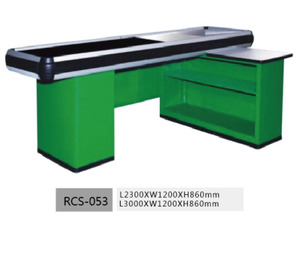 Main Counter Size 2000*600*850mm Deputy Counter Size 600*600*850mm Main Counter Packing Size 1850*650*900mm Deputy Counter Packing Size 650*650*900mm Sample Sample is not free, and you need pay for the shipping cost, but we will return the sample fee when you place an order. Payment Term We accept T/T, L/C for big amount, and for small amount, you can pay by Paypal,Western Union, Moneygram, Escrow and etc. 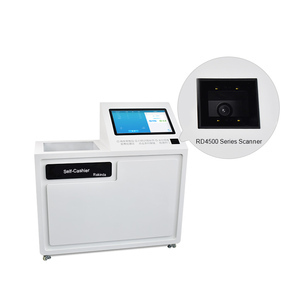 Alibaba.com offers 256 automatic cashier products. About 55% of these are checkout counters, 23% are pos systems, and 1% are printers. 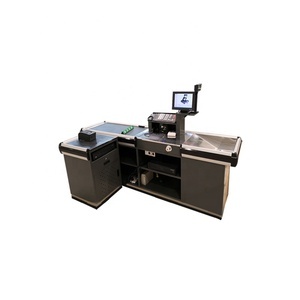 A wide variety of automatic cashier options are available to you, such as paid samples, free samples. 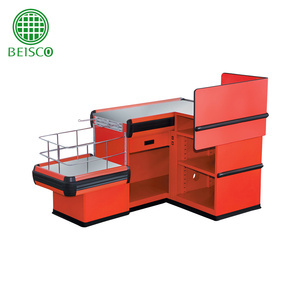 There are 256 automatic cashier suppliers, mainly located in Asia. The top supplying country is China (Mainland), which supply 100% of automatic cashier respectively. 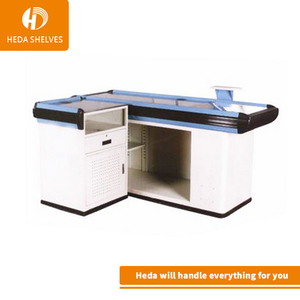 Automatic cashier products are most popular in Domestic Market, North America, and Mid East. You can ensure product safety by selecting from certified suppliers, including 153 with ISO9001, 70 with ISO14001, and 38 with OHSAS18001 certification.